There is a long history of using indoor residual spraying (IRS) for malaria control and it has proved very effective in Tanzania and other countries. However, the usefulness of IRS is under threat due to increasing mosquito resistance to all 4 classes of insecticides. 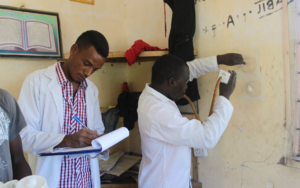 We are evaluating the neonicotinoid clothianidin as an insecticide for IRS in Tanzania. This insecticide has good potential for use in IRS against malaria vectors. Laboratory and field trials have shown great promise resulting in the new product being submitted to the WHO Pesticide Evaluation Scheme (WHOPES) for evaluation and recommendation. By conducting the study in Tanzania we will obtain evidence needed by National Malaria Control Program (NMCP) for their objective to improve Integrated Vector Management to consider new innovations especially those that address the emerging threat of insecticide resistance and preserving the effectiveness of modern malaria vector control.